Now, as we’ve previously written here on our website, we’re big fans of having a plan for your marketing, and I’d like to share a really simple web marketing plan that has been used to great effect by one of our clients. Now, I mentioned in a previous post about Samantha, who was particularly good at being involved in her social media by being consistent, having a long-term view, and making sure that she engages and interacts. Now, this particular case study revolves around a woman called Debbie who is an interior designer. Deb started her business just a few years ago from a standing start. She has plenty of experience in interior design, having worked for other people, but had never run her own business. Even a simple web marketing plan can have a great impact on your search engine results. So, through an existing client of ours, she contacted us with a view to having a website built. And we built her a website revolving around her work with design. And designers’ websites need to be very visual, and need to highlight the skill, and the design experience, and the design knowledge of the individual or the company. In Deb’s case, she literally started off, as we all do, with zero clients. Plenty of potential, but no money coming rolling into the door. So, we built her a website, not a complex site, but a website that highlights her work. And the two key areas that I told her and we told her to focus on was writing a blog about her work, including photographs of designs that she’s doing, work that she likes, designs that she’s particularly impressed with, and then also engaging and interacting with people on Twitter. Large numbers of people in the design industry are on Twitter. Now, these are the only two channels that Deb initially got to grips with. So, first things first, the blog. What I suggested to Deb was that she simply write on her blog a minimum of once a week about her work, putting up photographs of the designs that she was working on, stuff that she’d done, discussion, feedback from people that she’d worked with, testimonials. But, also then taking photographs of design that she likes, and writing about it, and writing about why she liked it. And the great thing about this, it began to build up two things. First of all, people who came to her website could take a look at the kinds of things that she was interested in, and the kinds of work that she’d done, and her thoughts on how it was put together. Now, she didn’t have to write lengthy posts if she was doing this regularly and consistently enough. All she simply had to do was to make sure something went into the website, into the blog, every single week without fail. Now, to be fair to Deb, she really got to grips with this quite quickly and ended up writing as many as ten blogposts a month, nothing lengthy, usually a photograph or two with a few dozen words. But, it was enough to keep Google interested in the website. You see, what Google really wants from a website is to see that things are happening. They want to see that the website is being updated. They want to see that a blog is being written, that there are articles being posted, that there are testimonials being put up there. Why? Because most, and I’m talking about whatever — 80% of small businesses and the self-employed don’t and won’t do this. It’s not like they can’t. So, Deb, literally — I wouldn’t say she went mad, but she really took hold of it with some enthusiasm. At one point, she went on holiday to Venice, took hundreds of photographs of interior designs while she was out there, came back, and then on her blog, wrote about what she liked about them. And combining that with Twitter, she started feeding this out into her market. She started letting people know that she was there and traffic started to increase to the website. So, there we go. To start with, get yourself a blog. If you don’t have a blog, you absolutely definitely must have one. Now, the second next thing that she did was she started connecting with people in her industry, and her local businesses, and people on Twitter. Deb lives in Leicestershire, so she wanted to initially start with the local market. But, the one thing Twitter really does well is it enables you to promote out your blog. So, every single blogpost that you write should get promoted and tweeted out. In Deb’s case people started sharing it on Twitter. She started getting retweets. Now, the joy of that, and this is the joy of social media generally, is that when people get the hang of paying attention to what you’re doing, believe it or not, you become a topic of interest for them. And, if you’re quite strategic and quite savvy with this, (and it doesn’t take a lot to get good at it), then you can start putting stuff out on a very regular basis and people will start retweeting it and favoriting your tweets. And every time somebody retweets it, it goes onto their Twitter timeline. And every time somebody favorites something, it goes onto their Twitter timeline. So, that means that all of their followers again, potentially, will see what you tweeted. And it didn’t take long for Deb to really get some traction with this. So, she was writing a blogpost a minimum of every week. She was tweeting that blogpost out. She was connecting with people, responding to people, retweeting other people’s stuff, just gaining some interest. The upshot of this was that Deb’s website took with no spend, no money shelled out on advertising, or pay-per-click, or SEO services, took less than six months to get onto the first page of Google for her target search terms. And, two years later, she’s in the top half of the first page. So, the point is this: even a very simple web marketing plan can work. You don’t have to spread your life across all of the social media, spend hours every week on Facebook, Twitter, Pinterest, LinkedIn etc. You don’t have to do this. If you keep it simple, keep it targeted, be consistent and be there, then you can do very well in SEO and in social media using as few as two channels. A blog, which is good for your overall site anyway, and also then Twitter, tweeting out what you’ve got to your audience. People will see it. Search engines will see it. And Google loves a website that’s being updated on a regular basis. If your website has a blog in it, and you’re putting something on it every single week, and your competitors are putting out something every single month, I promise you it won’t be long before your website starts outperforming your competitors. It’s the nature of the game. Now, I’ve written in the past on the blog about ways to get more blog content written. You can hire a copywriter or somebody to write blogposts for you. 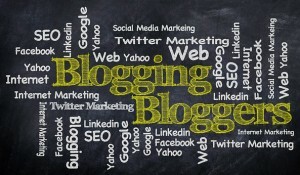 We could do that for you through our blog writing service. Or, you could use a digital voice recorder and record you talking about your topic and then send it off. Somebody types it up for you. It comes back and you’ve got the content. We do that sometime too. So, either way, there’s no excuse for you not to get out there, do some blogging, and then tweet your blogpost out to your following on social media. If you’d like some help with setting this up or writing your own simple web marketing plan then give us a call on 0116 3552194. If you’ve got any thoughts or questions on this, please put them in the comment section below. But, please, do yourself and your website a favour, get a blog and get tweeting. All sounds great progress but you don’t say how much actual work came in as a direct result of the client’s efforts. That’s a great question Val and you could easily argue that her blogging and tweeting was her efforts. We launched her website in the May and by the end of the year she was rushed off her feet with work, with much of it coming from her website as a direct result of being found in the search engines. I spoke with Deb just a few weeks back and, a couple of years on, she still raves about how many enquiries that her website generates. She’s never given me specifics (and, to be honest, I’ve not yet tried to pin her down on that) but I know that if it wasn’t doing its job then she’d let me know. But there is also a caveat with this: there’s no point in getting traffic to your website if you don’t follow up with the enquiries that you get. In our experience, far too many smaller businesses are very poor at converting enquiries into sales. Deb is a very personable but determined person and follows up with everything. Deb did a fair bit of networking and worked hard to develop contacts in target industries and businesses. This combined approach worked (and still works) very well. Overall, a website is just one of up to a dozen marketing channels that businesses should be using on a regular basis.